The versatile Big Berkey system is the ideal system for couples or small families at home, travelling with a caravan or camping, any other outdoor activities or during unexpected emergencies. The Big Berkey water purification system may be ordered with your choice of one discounted accessory. For a description of the various accessories see: Sightglass Spigot, PF-2 Fluoride/Arsenic Filters, Stainless Steel Spigot, Berkey Replacement Parts, Berkey Stand or Berkey Primer. The Big Berkey assembles in minutes without tools, electricity, water pressure, or plumbing. The Big Berkey is also easy to operate, clean, and maintain. The Big Berkey system removes pathogenic bacteria, cysts and parasites entirely and extracts harmful chemicals such as herbicides, pesticides, VOCs, organic solvents, radon 222 and trihalomethanes. It also reduces nitrites and unhealthy minerals such as lead and mercury (See which contaminants are eliminated by the Black Berkey Filters). This system is so powerful it can remove red food coloring from water without removing the beneficial minerals your body needs. Virtually no other system can duplicate this performance. Constructed of highly polished 304 stainless steel, the system comes complete with two purification elements and utilizes the latest technological advances. The upper chamber nests within the lower chamber for transport and stands only 33 cm. in height. I'm wondering if the Berkey system removes fluoride from the water? 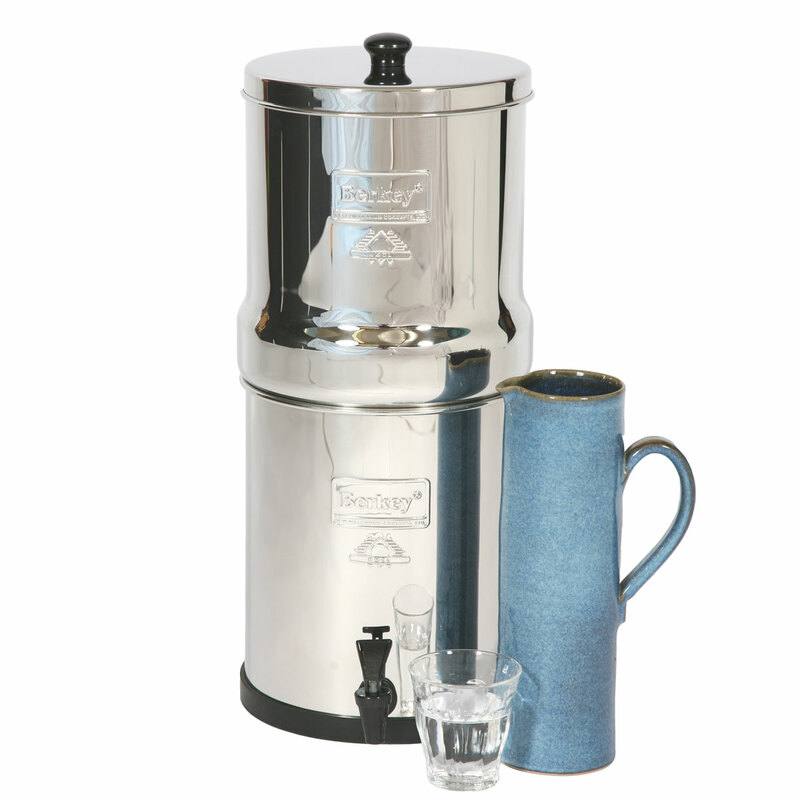 The standard Black Berkey filters do not remove fluoride for this you would need the extra PF-2 fluoride filters. These can be bought as a discounted accessory with every Berkey system and are attached to the Black Berkey filters. I have been using my Big Berkey for a year now. Do I have to replace the Black Berkey filters already? No, the Black Berkey filters usually last for years. To check when your filters need replacing please see the replacement calculator on the Black Berkey page. 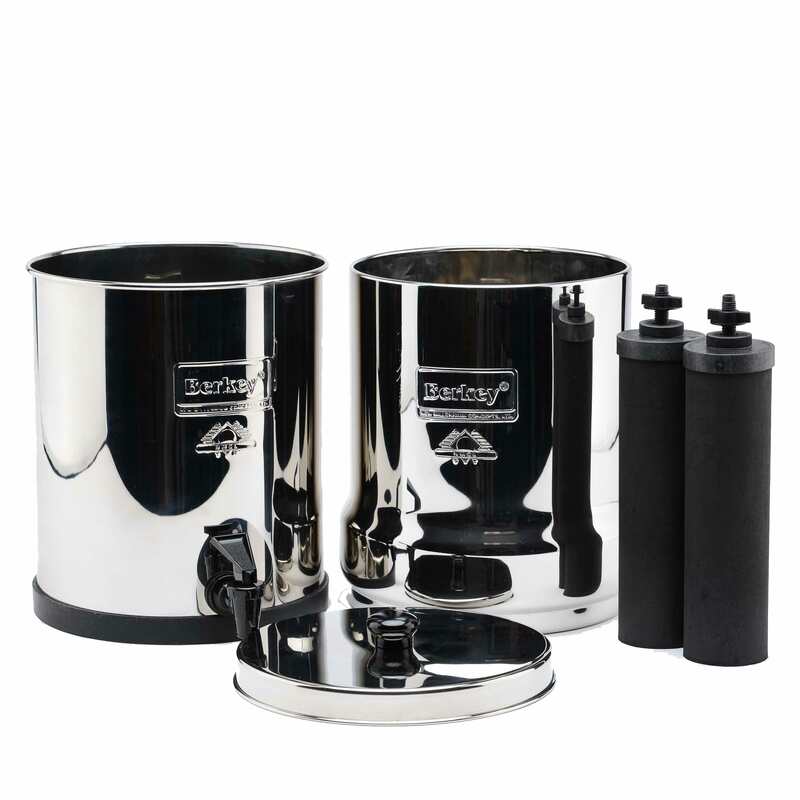 Does the Big Berkey come standard with 2 Black Berkey filters and can it be expanded to hold 4 Black Berkey filters? 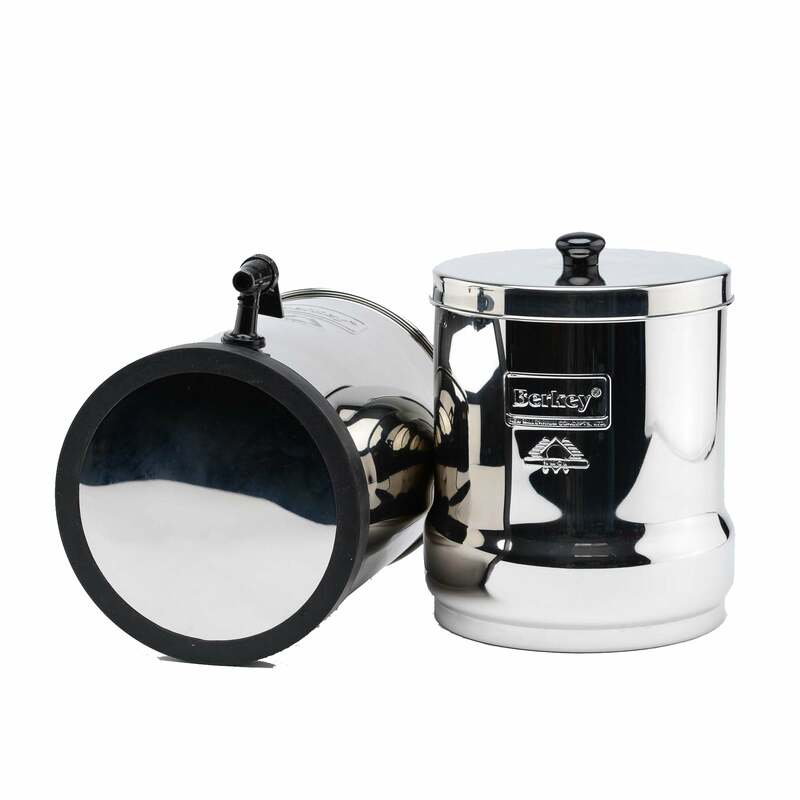 Yes the Big Berkey and all other Berkey systems come standard with 2 Black Berkey filters. The Big Berkey can be expanded to 4 Black Berkey filters and can be set up with 2 or 4 Black Berkey filters. The advantage of 4 filters is a faster flow rate and a longer lifespan. You can also order the Big Berkey with 4 Black Berkey filters and keep 2 Black Berkey filters in reserve as replacement filters. Just want to say thank you for our Berkey which we got from you in January, we are very happy with our Berkey. We live in an area with very hard water and we would like to know if it can affect our Berkey. When do we need to replace the filters and do we need to clean both containers regularly? We have found there are marks of limescale inside of both. Also does the filter remove limescale for drinking water or not? I am concerned that the stainless steel containers could lead to leaching of nickel into the drinking water. Has any research been done into whether this happens? Several studies indicate that nickel leaching may occur with 304 stainless steel however it is an extremely small amount (parts per billion) and typically it only occurs in an acidic solution, during cooking, etc. The purified water in a Berkey system is not acidic and should not cause any leaching to occur. 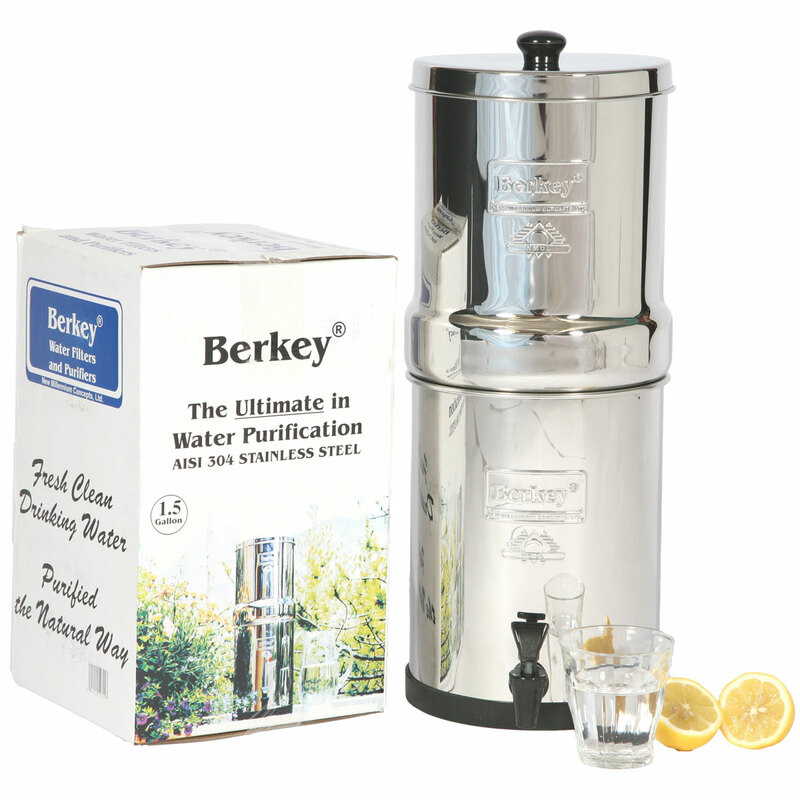 Just to emphasise Berkey purified water becomes more alkaline after passing through the Black Berkey filters. Please see the following reports from the National Center for Biotechnology and here. We live in rural France and we have problems with pesticide contamination of our mains water. Our daily usage for drinking would be around 8 litres. Which of your systems would be most effective? 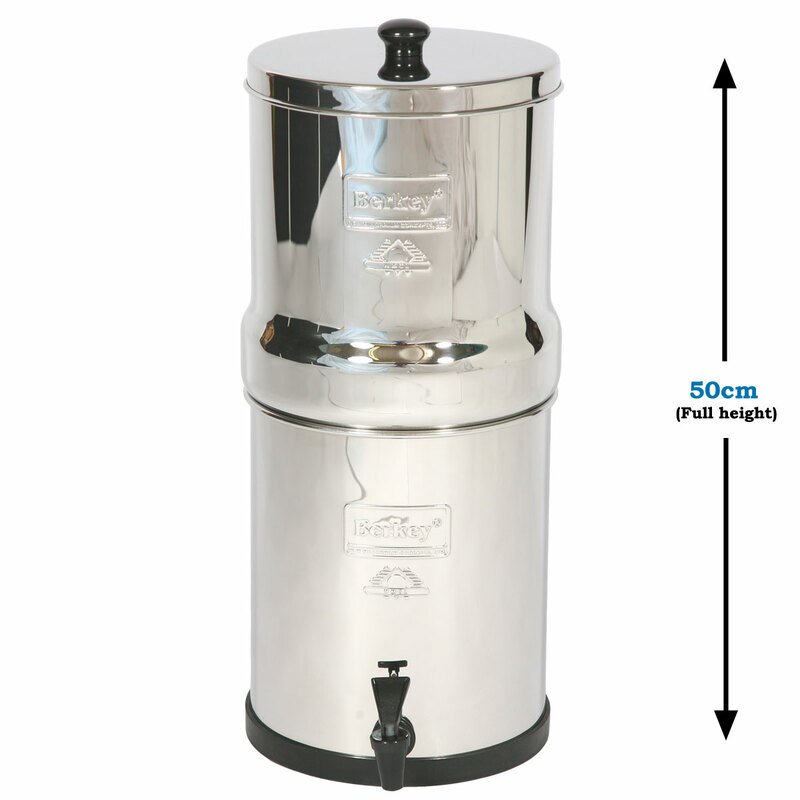 We would suggest the Big Berkey which has a capacity of 8.5 liters would be most appropriate in your situation. The Berkey systems all come standard with 2 Black Berkey filters and the only difference is capacity and the number of filters which can be installed in the larger systems. We wondered if the Berkey filters also remove hormones from the water? They sound fantastic, but we are also keen to find something that removes hormones as well. The Black Berkey filters have not been officially tested for the removal of hormones so I can make no claims for their elimination. Unofficially I can say that the likelihood is very high. Please see the following report (www.scientiareview.org/pdfs/169.pdf) regarding hormone removal by GBC carbon filters which are virtually the same as the Black Berkey filters and they attained a removal percentage >98% in various tests.